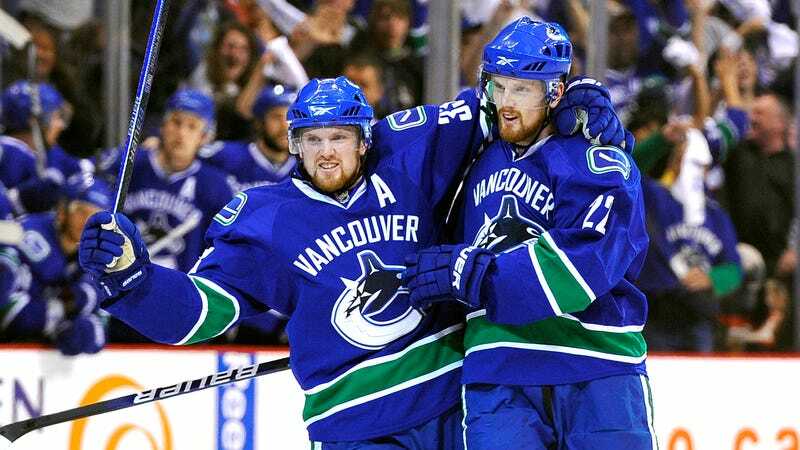 After an 18-year NHL career spent entirely together (not to mention several seasons with MODO in Sweden), Henrik and Daniel Sedin have jointly announced their plans to retire at the end of the season in a letter published on the Canucks website. With the Canucks out of the playoff picture, that means this Saturday will mark the final game for the Swedish twins, who will go down together as Vancouver legends. The Sedins were drafted by Vancouver second and third overall in the 1999 draft, after third-pick-holding GM Brian Burke finagled his way into also getting the second pick through a trade with Tampa Bay. (That’s a great time-warp video in the hyperlink by the way—from the Atlanta Thrashers’ inaugural season!) Together, the twins became the most iconic linemates of their generation, each scoring over 1,000 points in over 1,300 games. And though they failed to deliver Vancouver’s first Stanley Cup—falling short in a seven-game 2011 final—they still brought back sustained Canuck success that hadn’t been seen since Pavel Bure. Henrik won league MVP in 2009-10, and Daniel finished second in the voting the following year. Each Sedin also led the NHL in scoring once, and helped lead Sweden to an Olympic gold in 2006.